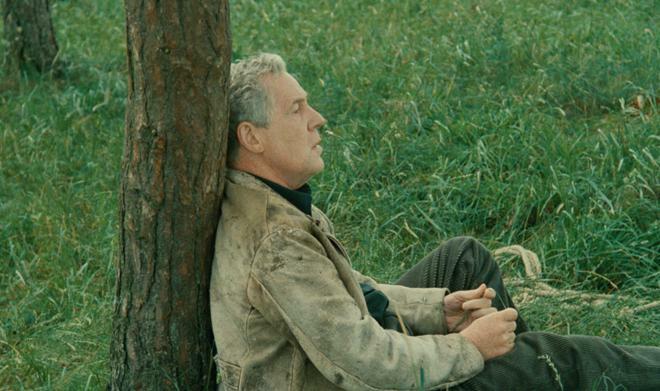 As the final film from legendary director Andrei Tarkovsky, The Sacrifice serves as a powerful curtain call for one of the medium's most acclaimed artists. Ambiguous yet deeply absorbing, the movie conveys stirring meaning and emotion through its striking style. And thankfully, that style is preserved wonderfully through a gorgeous transfer sourced from a 4K restoration and a strong mono mix. Extensive supplements help to round out the package, giving the film the special treatment it deserves. For fans of art-house cinema, this is Highly Recommended. A TV flickers mournfully across a group of crestfallen faces as news of global destruction ominously permeates throughout the room. According to the report, life as we know it may very well be coming to an end. But what if you could stop it? What if you could reverse the course of nuclear annihilation… for a price? What would you give up to save the world? That's the central conceit at the heart of celebrated Russian director Andrei Tarkovsky's final film, 1986's The Sacrifice. A cinematic parable steeped in deep ambiguity, the film follows a middle-aged man named Alexander (Erland Josephson) as he celebrates his birthday with a small gathering of family and friends on their remote island. But when World War III breaks out across the globe, the group dissolves into disarray, devastated and terrified by the world's impending doom. Bleak and frequently cast in a perpetual haze of grey tones, Tarkovksy's cinematically measured and faintly abstract approach should feel very familiar to any viewers already acquainted with his earlier films (Solaris, Stalker, Nostalghia). Conversations and spoken monologues espouse philosophical musings on truth, life, death, fear, religion, and spiritual degradation, while intermittent dream sequences hint at more vague allusions and underlying themes. And though a relatively clear narrative through-line does develop with Alexander attempting to stop the end of the world, the storytelling is ultimately anything but straightforward, allowing audiences to draw their own conclusions when all the smoke and dust settles. Relationship dynamics between the family and detours into the supernatural also end up playing a part in the plot, but these elements on their own would likely fall flat if not for the director's utterly absorbing visual aesthetic. The manner in which Tarkovsky presents his images heightens the deeper subtext between characters and the overarching mood of the piece -- using predominantly long, unbroken takes to create an expanded, almost otherworldly sense of time while reframing the camera to form new compositions that lyrically flow from one to the next. Certain shots, like the aforementioned scene of the family watching the war break out on TV, carry a ghostly power fueled by desaturated hues and sparse lighting. The climax itself is also a genuinely striking technical and artistic achievement featuring the characters chaotically scrambling as a house burns to the ground behind them in an extended wide shot that pans across the action. On that note, while the majority of the runtime is appropriately gloomy, there is a subtle undercurrent of absurdist comedy that seems to crop up every now and then as Alexander clambers his way through certain sequences, adding layers of understated farce to the otherwise heavy drama. Open to a myriad of interpretations, The Sacrifice is not an easy film to digest, but the movie's haunting images and ethereal mood create an absorbing and fittingly ambiguous experience. Tarkovsky tragically died of cancer a few months after the film's release, but his final effort serves as a fitting bookend to his storied career. Concepts of love, faith, mortality and, as the title implies, sacrifice are all complemented by a quietly arresting style. Though the director's full intentions might defy simple plot summary, his visuals convey an ever deeper meaning -- one that irrevocably defies words, evolving the language of cinema in a manner that few filmmakers ever have, or likely ever will. Kino presents The Sacrifice on a BD-50 Blu-ray disc housed in a blue case. A DVD is also included in the package with a documentary on the film's production, along with a booklet featuring excerpts from Tarkovsky's diaries and an essay by film scholar Robert Bird. After some warnings and logos, the disc transitions to a standard menu. The packaging indicates that the release is region A coded. The movie is provided with a 1080p/AVC MPEG-4 transfer in the 1.66:1 aspect ratio. Culled from a beautiful new 4K restoration, the image offers a marked improvement over the previous Kino release which is known to suffer from some DNR. The restored print is in nearly immaculate shape with a healthy layer of natural grain visible throughout, lending the image a wonderfully filmmic appearance witch rich texture and depth. 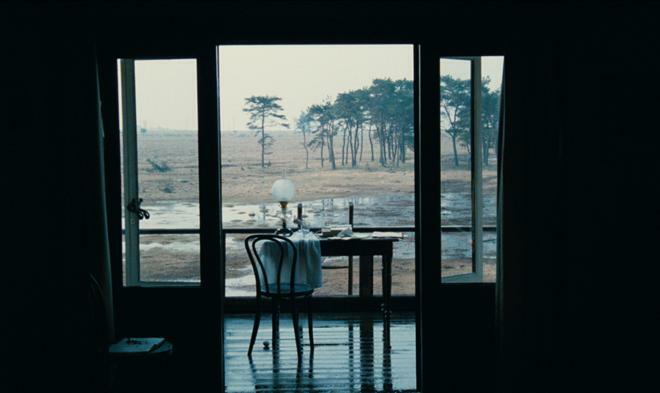 Clarity is strong, revealing great fine detail within every plane of Tarkovsky's frequently wide, ornate compositions. Close-ups are striking as well, rendering even the smallest wrinkles of worry and doubt on Alexander's increasingly weathered face. Colors are intentionally subdued, however, with many sequences adhering to a desaturated style marked by predominantly grey hues. Likewise, some dream sequences use an entirely black and white palette. Some comparatively vibrant greens, blues, and oranges are visible in the opening and closing scenes, but in general the aesthetic is deliberately dreary. Contrast is high in outdoor scenes set during the day, offering bright whites. With that said, though seemingly authentic to the print, black levels are a hair elevated and can lead to faintly murky quality in some of the movie's darker sequences. Thankfully, there are no signs of digital processing or compression artifacts. Blacks might not be as inky as some would like, but with this new restoration, The Sacrifice gets a beautifully filmmic and pristine HD transfer, presenting Tarkovky's striking images with the care they deserve. The film is presented with a Swedish DTS-HD MA 2.0 mono track, along with optional English subtitles. Dialogue is clean and surprisingly full-bodied (most, if not all of it was recorded after the shoot and post-synced), avoiding the hollow quality heard on some mono tracks from this time period. Though there is no channel separation, effects work is layered well within the track, gently emphasizing key sounds like rustling wind, crackling fire, and a ticking clock. Low frequencies even perk up during specific scenes, including a sequence with a rumbling jet overheard and another with bellowing thunder in the distance. Range and fidelity are also strong during recurring classical music cues from Bach. Age-related issues like crackle, pop, and hiss are entirely absent. Though inherently modest, this is a technically sound and artistically potent mono mix. Audio Commentary by Layla Alexander-Garrett – Tarkovksy's translator from the set of The Sacrifice provides commentary on this track, offering a very informative mix of production anecdotes, story analysis, and insights into the director's process. There are some gaps in the discussion, but Alexander-Garrett offers a very worthy listen for fans of the film. Interview with Michal Leszczylowski (HD, 32 min) – The co-editor of The Sacrifice and the director of Directed by Andrei Tarkovsky sits down for this interview. Leszczylowski discusses his work on the film, how he met the director, Tarkovsky's death, and the making of his own documentary. 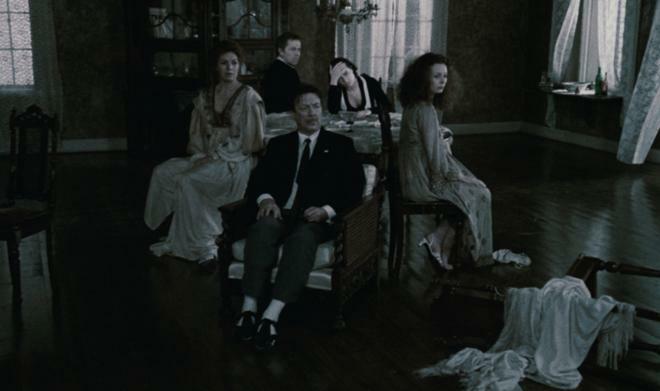 Trailers (HD) – Previews for The Sacrifice (2 min) and Tarkovsky's 1983 film, Nostalghia (3 min) are included. Directed by Andrei Tarkovsky (SD, 101 min) – This is a feature-length documentary about the making of The Sacrifice directed by that film's co-editor. Filled with tons of fly-on-the-wall on-set footage of the Tarkovsky in action, along with voiceover excerpts of Tarkovksy's musings on time and cinema, this is a fantastic inclusion, offering some great insights into the creative process and an unfiltered look at some frustrating moments during the shoot. 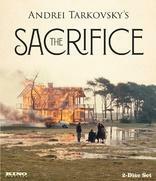 Andrei Tarkovsky's The Sacrifice is a visually striking and emotionally resonant exercise in cinematic ambiguity. As the director's final film, the movie offers a fitting testament to his storied career. The HD transfer sourced from a new 4K restoration is exceptional, and the mono audio mix is free from any age-related issues. An insightful commentary and a comprehensive making-of documentary round out an excellent package from Kino. For art-house aficionados, this is Highly Recommended.